It’s not always the bottom line. How many of us can say we have been a loyal customer to a brand for over 40 years? If you look at this picture, you will see an Instagram photo that I sent to Patagonia when they asked for pictures of folks who had vintage clothing produced by Patagonia back in the day. They liked this photo and put it on their Instagram feed one day. I was proud to say that I still have that original Patagonia pile pullover and wear it to this day. 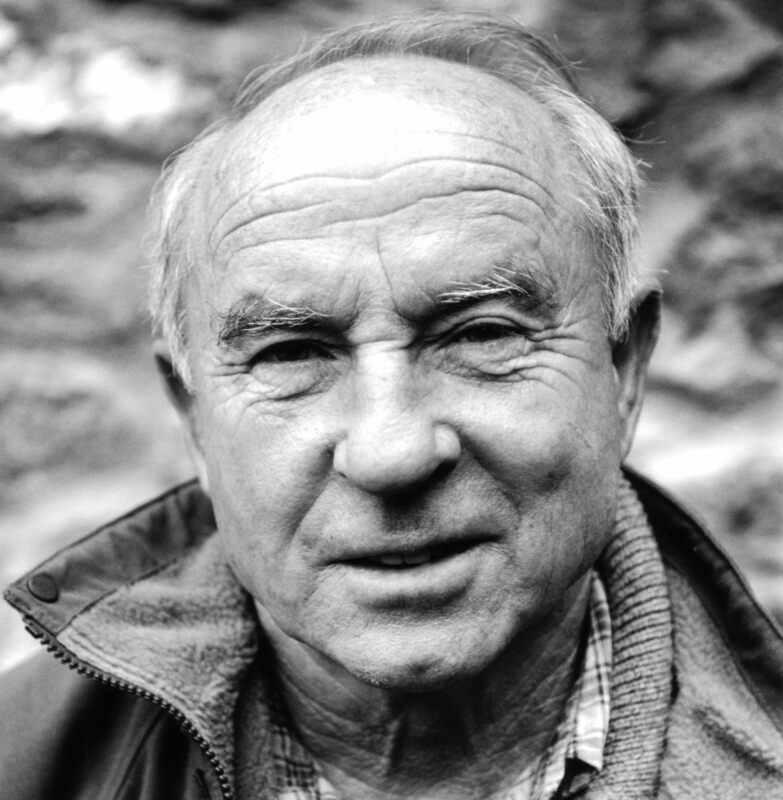 It is a testament to what Yvon Chouinard says above. 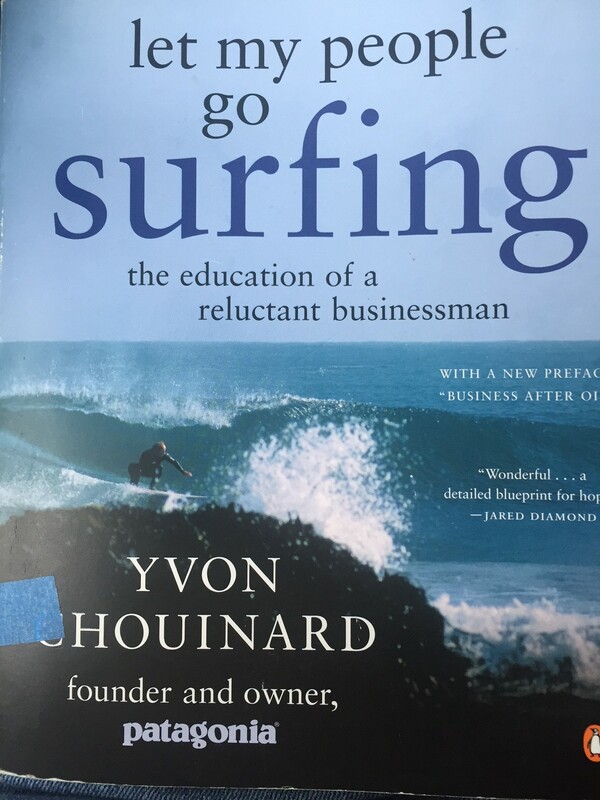 If you take the time to read Chouinard’s book ” Let my people go surfing. the education of a reluctant businessman” you will find a fascinating story of a guy who had a very meager upbringing in Quebec, a “dirtbag” lifestyle as a climber in Yosemite ( dirtbag being a proud moniker for climbers), and finally an extremely successful business man whose main goal is the quality of his work and the welfare of his workforce. The impressive thing to me about Chouinard is that he really means what he says. He is committed to the environment. The paper that they use for their catalogs is recycled. Their T-Shirts are made from organically grown cotton. The first Synchilla jackets were first made using fiber from recycled soda pop bottles. As a company they petitioned the Federal Energy Regulatory Commission on decommissioning dams in the Pacific Northwest to once again allow salmon to spawn upstream. Finally, he and his wife Malinda have purchased huge acres of property in Patagonia in South America and have created a natural preserve there that is unique. In short, Yvon is totally committed. Many companies today have finance and profit as the “tail that wags the dog.” Patagonia has always been reluctant to cut costs, skimp on quality, or lay off employees all to meet the bottom line. From the founder on down, their philosophy of quality first has allowed them to be a wildly profitable company without profit being the main driver. 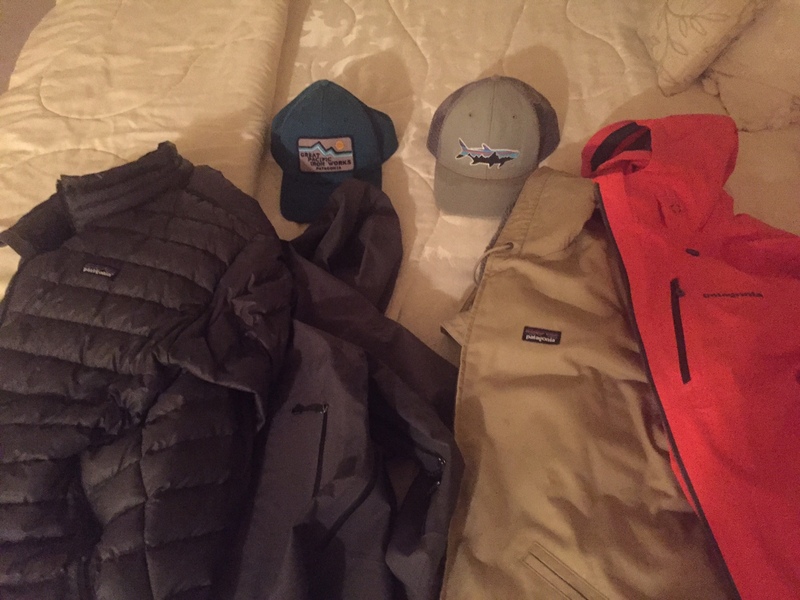 So, I have always liked the quality that Patagonia produces and that is why I have been a loyal customer for over 40 years. When I read Chouinard’s book, I became even more of a dedicated customer and proponent for the mission statement of Patagonia. Whether you are an outdoors type or not, this book has value in describing what is not a traditional business model. Pick it up and read about a fascinating blacksmith who created one of the most iconic brand names that we have in outdoor apparel today. Thanks for reading. Photo of Pat at Tuckerman Ravine- courtesy of Eric Durfee. This entry was posted in American Culture, Business;, Culture, Inspiration, outdoor activities, outdoor sports, Outdoors, recreation and tagged Clothing, Patagonia, Yvon Chouinard. Wow, talk about a dream job, lol. I love reading about companies like this. Do you still have this book? Interesting to know & Great clothing !! Pat yes indeed Patagonia is the best all around , have a closet full of there gear. Yvon for sight in the envoroment as well as busness thinking is unmatched by any one . 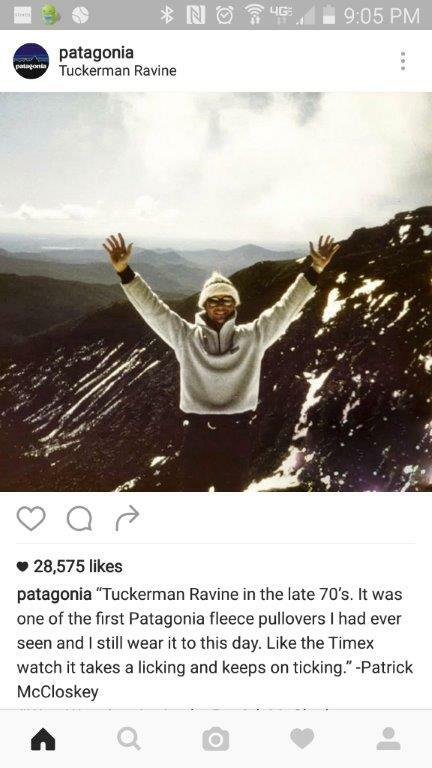 I don’t see any credits for the photograph of you at Tuckerman’s. Obviously it’s not a “selfie”. Just sayin’. love the patagonia pieces that i have too! I am a little partial to that green descente shell that you have though! Bring it this year! We will be skiing on St. Patricks day! Pat, good read, as usual. We are lucky to have one of Patagonia’s distribution warehouses near us, in Reno. I was snowshoeing last winter on the back side of Mt Rose (the mountain, not the ski area) and I met one of Patagonia’s employees out in the middle of nowhere. Luckily I had a Patagonia shell on that day. He loves working for Patagonia and went out of his way to tell me when their next warehouse sale was going to be. Next time you come out, we’ll head down to their warehouse and check out what they are blowing out the door. Also, thanks for the photo credit!!! Loved seeing you featured in “Worm Wear”. I also love Patagonia. Last year at NY fashion week they ran an ad in the NY Times of a pair of 10 year old boardshorts and asked people not buy their product unless they really needed it.